Thanks goes to the OEW Group for Providing this weekend update! This week saw the SPX/DOW/NAS/NDX all move higher. The SPX gapped up on Monday to open the week at 2849 and moved higher for the rest of the day. Tuesday saw a pullback from 2873 to 2859, then the rally continued with the SPX hitting 2885 early on Wednesday but fell to 2865 later in the day. Thursday saw consolidation between Wednesdays range. Friday the market moved higher to 2893 and closed there at the weeks high. For the week, the SPX/Dow gained 2% and the NAS/NDX was up 2.7%. On the economic front, we saw an uptick in the ISM Manufacturing Index, auto sales, truck sales and Nonfarm Payrolls. There were negative reports for retail sales, construction spending, durable order, ADP Employment Change, and ISM Non-Manufacturing Index. Next week’s report will highlight factory orders, NFIB Small Business Optimism Index, JOLTS – job openings, CPI, PPI, the FOMC minutes, and the University of Michigan Sentiment Index. Most of the foreign indices we track had a strong week, with China, Germany and Greece showing the largest gains. 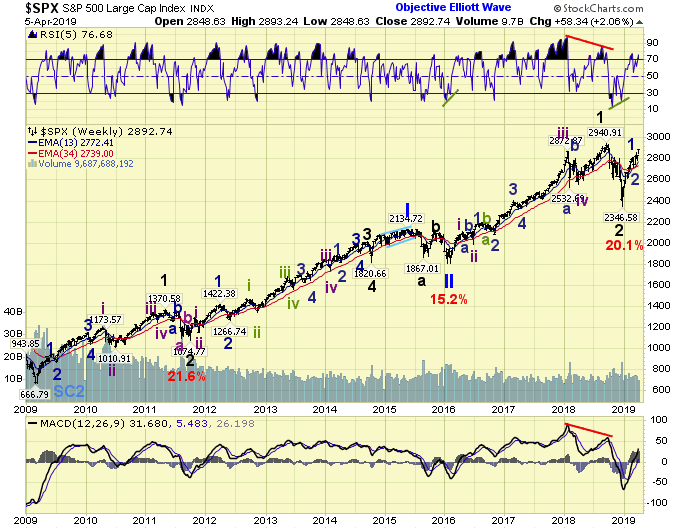 We’ve been tracking three high probability counts waiting for the markets to give direction, noting the divergence between the Dow and other major indices. This week gave us the answer as the Dow rallied to new recovery highs, the SPX continued higher, and the NAS/NDX continued to lead the way higher. 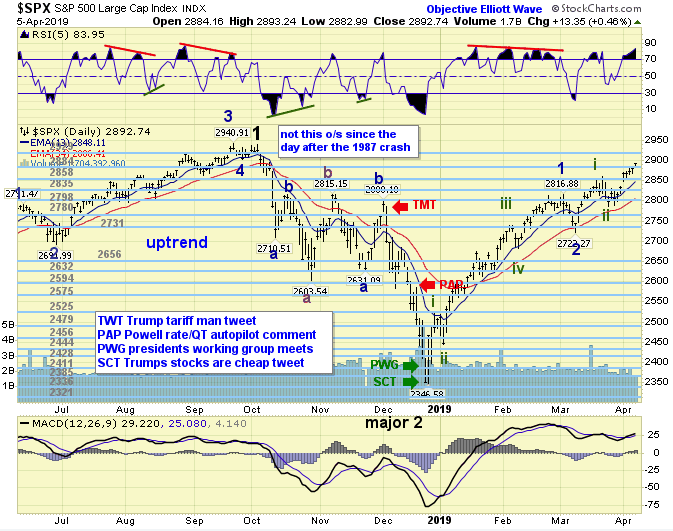 Thus, we updated the charts aligning the Dow with the SPX wave count showing the Minor 1 top at 2817 with Minor 2 ending at 2722 with Minor 3 underway. 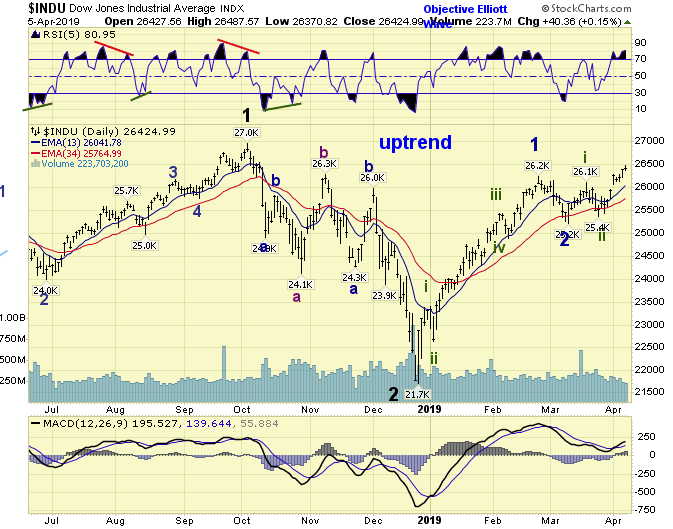 We expect Minor 3 will extend higher to all time highs in the coming weeks. We’ve noted the strength in the Nasdaq and Nasdaq 100 indices. Today, we’d like to highlight the strength of the Semiconductor Index. This is a key industry sector as it often leads the general market. The SOX topped in early 2018, well before the general markets top in late September/early October. 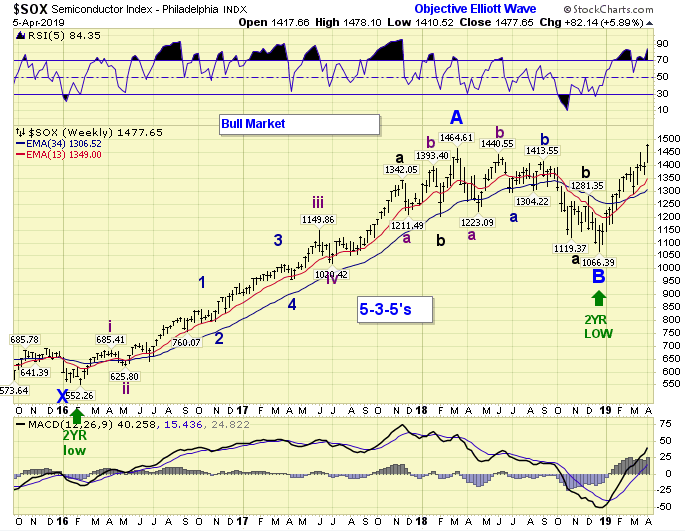 We’ve been anticipating December as a possible 2 year cycle low and a tentative B wave completed. This week we got confirmation of that as SOX rallied to a new all-time high. From the Minor 2 low at SPX 2722, we count a single trend rally to 2852 followed by an irregular B wave correction (2812>2860>2785). We are counting the high at 2852 as Minute i and the low at 2785 as Minute ii. The rally off the Minute ii low also appears to be subdividing into Micro waves as shown on the 60 minute SPX chart. Short term support is at the 2884 and 2858 pivots, with resistance at the 2929 and 2995 pivots. 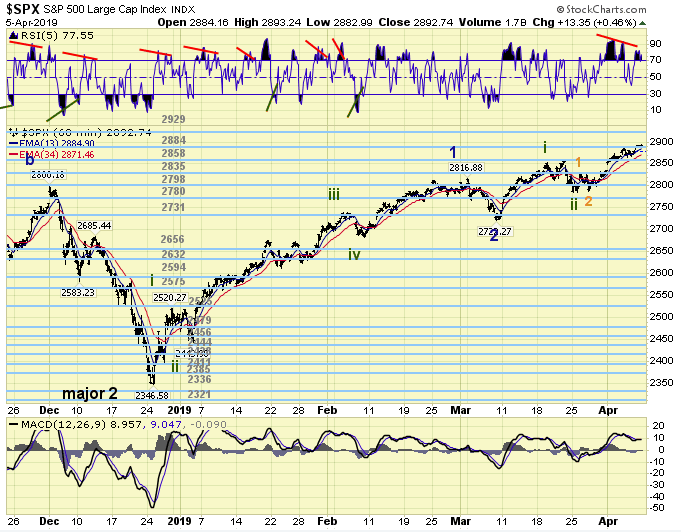 The week ended with a negative divergence on the 60 minute SPX chart. Asian markets were up as much as 5.0%. European markets were up from 2.3 to 4.6%. The DJ World index gained 2.1%, and the NYSE gained 1.8%. Bonds are in an uptrend with the 10 year treasury losing 0.45%. Crude remains in an uptrend and gained 4.9%. Gold is in a downtrend and lost 0.2%. Bitcoin is in an uptrend and gained 22.4%. The USD is in a downtrend and lost 0.37%. Christine mentioned Narcissistic Personality Order about a week ago, and I’d like to point out that the 3 dominant characteristics of people with NPD are that they demand to always be the center of attention, they demand to constantly be praised (even if no one else praises them, they will always praise themselves,) and they are non-stop compulsive liars. In a blog such as this, those characteristics would show themselves by a person posting 20-30 times per day (when everyone else honors the 3 post rule that Tony always requested,) constantly posting that they are taking profits (never losses,) and having most of those posts consist of fake trades. The person will almost never post an entry in real time, because that would immediately expose the obvious lies of the fake trades. They are just saying, tone the bravado down a bit. It’s not necessary. Everyone knows that people that trade win some and lose some. Nobody knows the future and nobody is right all the time. So there’s no reason to talk down to the others. The blogosphere is an interesting place for sure and it takes some getting used to . . . given that its easy to obtain instant credibility without any accountability or authentication. I’ve been around the markets for 39 years and started trading professionally in 1984 as a floor trader in #4 WTC in NYC. I can tell fairly quickly whether someone is being “genuine” with their posts or not. I’ve learned to simply “skip” over posters who constantly beat their chest. No one is a genius in this business. Phil, I don’t doubt your integrity, can’t see any reason why anyone would spend as much time as you do on here posting unless you’re either getting something out of helping people or getting something financially from it. Unless you’re a pseudonym for David Halsey then it has to be the former. But it has to be said it’s hard to always follow what your positioning is, or to know when you’re in or out of the market. I think that’s why some are pushing back. With your kind of system it’s absolutely essential that execution is flawless so there’s no ambiguity on when you do what… if someone is blind following you they’d need every single trading action to be posted (entries, stop, exit, partial exit, trailing stops) and in real time… if you miss out some of these then the posts aren’t going to tie in with each other, and people will be asking ‘hang on, when did he enter or exit, I didn’t see that mentioned’. Even if you manage to post 80% of your actions without the other 20% it’s unfollowable. I think you post about too many asset classes so it’s almost impossible to keep on top of them all every time something changes. If you just focussed on one or two with a complete audit trail every time you do something then nobody would be able to question you like this as the results would be there for everyone to see. Not all readers post. I enjoy Phil’s and asaraniti’s posts. I don’t trade every second, so I just get general flavor. On the other hand, I can’t say I remember lml25’s contributions at all. And furthermore I can’t stand mcgcatial pages and pages and pages of absolute gibberish. Have even considered thinking about what you want to say in advance, instead of rambling as you type? i really dont care if anyone believes or not . Ok but if you take this last move as an example, you did say yesterday that you had no interest in SPX because of all the chop.. which was a fair point because it was really annoying price action. So I took that to mean you were neutral, so no position. So did you go long for the last pop, and if so when? Most of the move happened overnight so guessing you wouldn’t have gone in then… so I guess people are thinking if you’re neutral yesterday, go to bed and wake up to find it above 2900, what’s the trading action there? Or when you say take profits into 2910, is that just for people already long? Guessing you wouldn’t short 2910 because at that point we’re still in a series up, so it would need to break your long by going back under 2900? So doesn’t that mean no actions for you today so far on SPX? no more explanations about DH method ever again mark…. so we’ll see you Monday…. I ser my phil comments were censored.But B.S. is allowed.Go figure.The New OEW site rules have been established. Well this is an EW site with a focus on the long term is how I’ve always read it, not a bucket shop…. Just tried to post a long but neutral comment helping to explain setups on using 1 particular algorithm and it was either blocked or waiting moderation. My post appears on the side bar but doesn’t format on the screen. Phil, You have done good! No need to beat a hollow tree, when the student is ready the teacher will appear. Until then, its its noise to some. Happy Friday, Traders! there are some who understand …. and others who want to learn…. Hey, Phil, forget these haters! There are plenty of us who appreciate what you’re trying to do. Look what Jesus did and he got rejected (and still does)! Thanks to you and asa for explaining your method, even tho I haven’t fully captured it yet. better said ,,, when the light bulb goes on ..